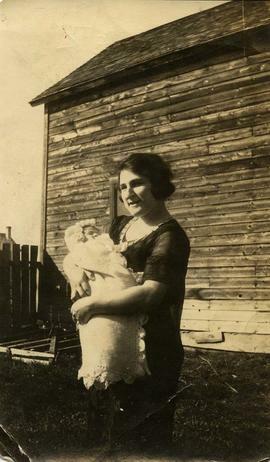 Photograph depicts Ann Nemetz holding Phyliss Nemetz, Zelma, Sask., 1921-22. Other copies available; refer to PastPerfect for details. Photograph depicts a Grade 1 class, Watrous Sask., Nathan Nemetz in back row, far right. 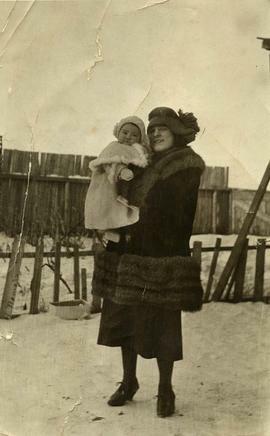 Photograph depicts Harry Nemetz, General Merchants store, grandfather W. Karasov holding Phyllis, Milton in sled, in Zelma, SK. Photograph depicts Philip Dayson and Rosalie Wosk, possibly on a Dayson visit to Vancouver. Photograph depicts Teacher Miss McEachern, extreme right, Nathan T. Nemetz, age 6. Photograph depicts the Nemetz store in Zelma Saskatchewan; Grandfather W. Karasov holding Phyliss Nemetz with Milton Nemetz in the sled. Other copies available; refer to PastPerfect for details.